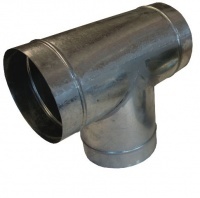 These galvanised T-Pieces are a great way of combining ducting from two areas for use with one fan. Suitable for use with standard and acoustic ducting, we recommend using ducting jubilee clips or metal heat resistant tape to ensure an airtight fit. If you are looking to split ducting coming from an intake fan – such as when putting in two runs of Cool-Tubes – then using a Y-Piece instead is preferable as it allows smoother airflow; T-Pieces are best suited for extraction with the air being drawn through them.